Those of us with budding artists at home know how fast beautiful little drawings and paintings can accumulate. Once the fridge and the edges of the dresser mirror are covered, what do you do next? Little creative minds can’t (and shouldn’t!) be stopped, but displaying artwork on the walls comes with a set of problems: tape or holes on the wall, and rips and/or holes in the artwork. 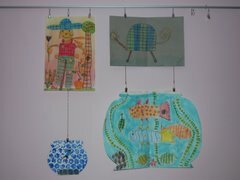 At Curtain-Tracks.com we have an inexpensive system that will allow you to create a ready-made art display space that will last until your little one heads off for art school. Here’s what you will need: First, the track: We have several to choose from and they can be mounted to the ceiling or the wall, whichever you prefer. After you have picked your track, you will need a compatible carrier. The type of carrier you use will depend on what kind of track you picked, and we can help you figure out the best choice. From the carrier you will hang one of our inexpensive hooks. The last two pieces of drapery hardware you will need are the most important for art displays. From the hook you will hang a beaded chain with a hook, and to this you will attach a steel bulldog clip. You will then have created your own home art gallery. Removable eyelets allow the beaded chain to be cut to custom lengths, which will allow you to hang the artwork all at the same level, or at different heights, as you like. The bulldog clips will gently hold your little artist’s drawings and paintings without tearing or making holes. They are simple and safe enough that budding artists of all ages can easily hang and rearrange drawings and paintings as they like. They are light enough that you can even use two bulldog clips and hooks with a bit of chain to hang a drawing from the bottom of another, creating a whole wall full of art. Your little ones can create a new art gallery every day. 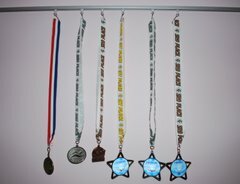 This is also a great way to display homework, report cards, and even medals. Have you created an art display using our tracks and accessories? We would love to see it! Send us photographs at info@curtain-tracks.com.